Herbert George Wells adalah seorang novelis, jurnalis, sosiolog, sekaligus sejarawan berkebangsaan Inggris. Dia lahir di Bromley, Kent, Inggris pada tangal 21 September tahun 1866 dan meninggal saat 13 Agustus 1946 di London. Dia terkenal karena novel fiksinya, seperti The Time Machine dan The War of the Worlds, kemudian komik yang dibuatnya, antara lain Tono-Bungay dan The History of Mr. Polly. Bersama dengan Jules Verne, Wells disebut sebagai "Bapak Fiksi Ilmiah". Dia dibesarkan oleh keluarga yang miskin. Lalu saat usianya mencapai 14 tahun, dia bekerja pada pedagang kain di Windsor, namun dia segera dipecat oleh tuannya. Kemudian menjadi asisten seorang ahli kimia, bekerja pada pedangan kain lagi, sampai akhirnya ketika tahun 1883, dia menjadi penjaga pintu di Midhurst Grammar School. Selanjutnya saat umurnya 18, Wells memperoleh beasiswa untuk belajar biologi di Normal School of Science (kemudian disebut Royal College) di Kensington selatan, London. Wells lulus dari London University tahun 1888. ^ a b c d e f g h "H.G. Wells". Encyclopedia Britannica. Diakses tanggal 15 Juni 2014. ^ Adam Charles Roberts (2000), "The History of Science Fiction": Page 48 in Science Fiction, Routledge, ISBN 0-415-19204-8. Dickson, Lovat. H.G. Wells: His Turbulent Life & Times. 1969. Wikimedia Commons memiliki media mengenai Herbert George Wells. Wikisource memiliki teks artikel Ensiklopedia Britannica 1911 mengenai Wells, Herbert George. Karya H. G. Wells di Project Gutenberg, pre-1923. New Statesman – In the footsteps of H G Wells at www.newstatesman.com, H.G. Wells called for a Human Rights Act. 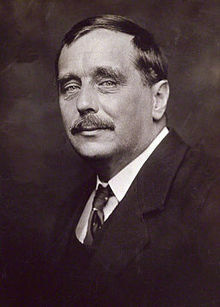 H. G. Wells: The Man and the Author. A biography of H. G. Wells by Roman Allemann (2000). "H. G. Wells warned us how it would feel to fight a War of the Worlds", by Niall Ferguson, in The Telegraph, 24 June 2005. "When H. G. Wells Split the Atom: A 1914 Preview of 1945", by Freda Kirchwey, in The Nation, posted 4 September 2003 (original 18 August 1945 issue). "Wells, Hitler and the World State", by George Orwell. First published: Horizon. GB, London. August 1941. "War of the Worldviews", by John J. Miller, in The Wall Street Journal Opinion Journal, 21 June 2005. "FROM THE WORLD BRAIN TO THE WORLDWIDE WEB", by Martin Campbell-Kelly, Gresham College Lecture, 9 November 2006. "The Beginning of Wisdom: On Reading H. G. Wells", by Vivian Gornick, "Boston Review", 31.1 (2007). "The Chronic Argonauts" · "The Country of the Blind" · "The Crystal Egg" · "The Star" · "Empire of the Ants" · "The Land Ironclads" · "The Magic Shop" · "The Man Who Could Work Miracles" · "The New Accelerator" · "The Truth About Pyecraft" · "Mr. Ledbetter's Vacation" · "The Red Room" · "The Stolen Body" · "A Story of the Days to Come" · "A Story of the Stone Age" · "A Vision of Judgment"
Nama alternatif Wells, H. G.
Halaman ini terakhir diubah pada 6 Desember 2018, pukul 01.37.